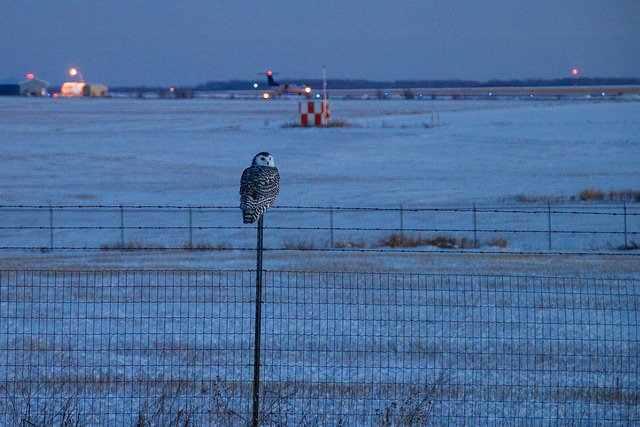 A snowy owl at an airport in British Columbia. Photo by tuchodl, used under Creative Commons licensing. Reposted from Ensia under Creative Commons licensing. In the winter of 2013–14, hundreds of milk-white birds with luminous yellow eyes and wingspans of up to 5 feet descended on beaches, farmers’ fields, city parks and airport runways throughout southern Canada and the United States. Traditionally, snowy owls spend most of their time in the Arctic and subarctic regions. But every four years or so when populations of lemmings — among the owls’ favorite foods — cycle downward, a small number of young, inexperienced birds that are less adept than their elders at hunting will fly farther south than they might normally rather than starve to death. No one, however, had seen an irruption as big and as far-reaching as this one, which was the second major such event in North America in three years. By the first week of December, the big birds were spotted from North Dakota to Maine and from Newfoundland to Bermuda. At one point, owls collided with five planes at Kennedy, LaGuardia and Newark airports. Snowy owl irruptions are not in themselves a sure sign that something extraordinary is happening in an Arctic world that is warming nearly twice as fast as the global rate. But given the rapid-fire fashion in which similar, unexpected events have been unfolding throughout the circumpolar region, it’s clear that the Arctic we know is coming to an end, and that a new and very different Arctic is taking over. What happens in the Arctic matters. The ecological, cultural and economic shifts that are currently underway will not only alter the lives of the Inuit, Gwich’in, Nenets and other aboriginal people who live there, they are likely to affect mid-latitude weather patterns, the migrating birds we see, the air we breathe, the fuel we burn and the way in which we transport goods from one continent to another. The question then becomes, how do we understand and manage the end of the Arctic as we know it so we are prepared to deal with the new Arctic that is unfolding? The past 10 years paint a dramatic picture of climate-related changes at the top of the world. First there were massive forest fires that torched a record 4.2 million hectares of trees in the Yukon and Alaska in 2004. Smoke from those fires could be detected all the way to the east coast of Canada and throughout many parts of the contiguous United States. Parts of the Alaska Highway were shut down for days at a time. Alaskans suffered for 15 days when air quality in cities such as Fairbanks was deemed to be hazardous to health by U.S. Environmental Protection Agency standards. Then it was the collapse of the 9-mile-long, 3-mile-wide, 120-foot-thick Ayles Ice Shelf off the north coast of Ellesmere Island in 2005. Scientist Warwick Vincent likened the collapse, the largest recorded in the Canadian Arctic, to a cruise missile hitting the shelf after it registered as a small earthquake at a seismic station 150 miles away. In 2006 we learned of the world’s first wild polar bear–grizzly bear hybrid, of further increases in relatively warm Pacific water flowing north through the Bering Strait, of gray whales overwintering in the Beaufort Sea instead of migrating to the California coast and — from the U.S. National Snow and Ice Data Center — news that September sea ice was declining 8.6 percent per decade or 23,328 square miles per year. At the time, some scientists scoffed when NSIDC research scientist Julienne Stroeve predicted that the Arctic Ocean would have no ice in September by 2060. But when Arctic sea ice retreated to another record low a year later, many suggested September ice might be gone by 2040. Then came 2007 — the year in which it became crystal clear that winter’s freeze was losing its ability to keep up with summer’s melt. A rare, extraordinarily large tundra fire on the north slope of Alaska accounted for 40 percent of the area burned in the state that summer. Avian cholera, a disease that is common in the south but largely absent in the eastern Arctic, killed nearly one-third of the nesting female common eiders at East Bay, home to the largest colony of the species in the region. It was so warm that summer that the Inuit of Grise Fiord, the most northerly civilian community on the continent, were forced to stockpile sea ice for drinking water because runoff from a nearby glacier dried up. For the third year in a row, hundreds of beluga whales and narwhal made the mistake of staying in the Canadian Arctic longer than they should have because there was still much open water when summer came to an end. In Lancaster Sound alone, Inuit hunters shot more than 600 belugas that would have otherwise drowned as the small pools of open water they were trapped in shrank to nothing over a 10-day period. But what really made the big melt of 2007 an eye-popping one was the absence of ice in areas where it almost never thaws. The so-called “mortuary” of old ice that perennially chokes M’Clintock Channel in the High Arctic of Canada virtually disappeared that August. The “birthplace” of a great deal of new ice that is manufactured in Viscount Melville Sound to the north was down to half of its normal ice cover. “The ice is no longer growing or getting old,” said John Falkingham, chief forecaster for the Canadian Ice Service. Extraordinary as the events of 2007 were, the changes that have been brought on by a rapidly warming Arctic have not let up since then. In 2010 and 2012, 100 square miles and 46 square miles, respectively, broke away from the Petermann Glacier in Greenland. The presence of so much warm open water in 2012 — when another record low for sea ice cover was established — fueled an unusually powerful summer cyclone that tore through the Arctic for nearly two weeks. It wasn’t just sea ice that was being churned up and melted more quickly by these increasingly powerful storms. In the Yukon-Kuskokwim delta in Alaska, which is already vulnerable to rising sea levels, storm surges sent waves of saltwater more than 30 kilometers inland on three occasions between 2005 and 2011. This doesn’t bode well for the million birds that nest in the delta nor for the Chinook (king) salmon, which have been in steep decline in the region for more than a decade. This year’s run of between 71,000 and 117,000 was expected to be as poor as last year’s, which established a record low. Even among all this, one of the most recent signs of change has been especially alarming. All across the Arctic, scientists have been detecting abnormally high concentrations of methane seeping out of the thawing permafrost. In one spectacular example discovered along Siberia’s Yamal Peninsula in 2014, concentrations of the greenhouse gas 50,000 times higher than the atmospheric average were found to be rising from a 200-foot-deep crater that was formed when a massive sheet of permafrost thawed and collapsed. In another case in Canada’s western Arctic, three of many seeps found in the area were found to be emitting as much greenhouse gases in a year as are emitted by 9,000 average-size cars. Along the west coast of Hudson Bay, polar bears are producing fewer cubs and fewer are surviving beyond the first year of life. Photo credit Edward Struzik. We are already seeing the effects of some of these changes ripple through various ecosystems. Capelin, not Arctic cod, is now the dominant fish in Hudson Bay. Killer whales, once stopped by sea ice, are now preying on narwhals and beluga whales throughout the Arctic Ocean. Pacific salmon of all types are moving into many parts of the Canadian Arctic where they have never been seen before. 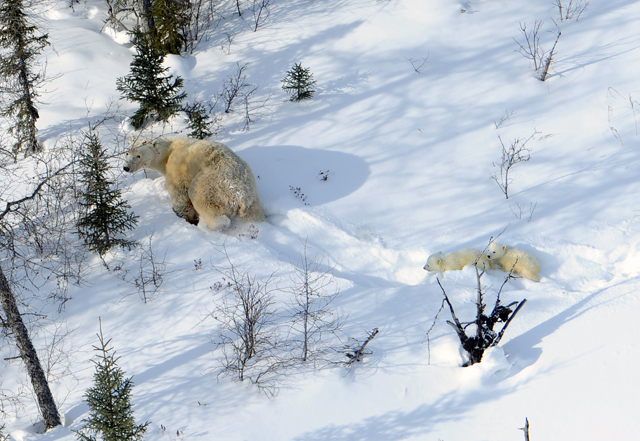 Polar bears at the southern end of their range are getting thinner and producing fewer cubs than they have in the past. Chukchi Sea walrus are hauling out on land by the tens of thousands, as 35,000 of them did in September 2014 when there was no more sea ice to use as platforms. The changes that are occurring are circumpolar. In the Norwegian archipelago of Svalbard, fjords on the west coast have not been frozen for several years. Tundra there is being overtaken by shrubs, just as it is in Siberia, Chukotka, Arctic Canada and the north slope of Alaska where barren ground caribou — fixtures on the summer tundra — are dramatically declining. According to the CircumArctic Rangifer Monitoring and Assessment Network, which is run on a voluntary basis by veteran biologists Don Russell, Anne Gunn and others, half of the world’s 23 barren-ground caribou herds that are routinely counted are in decline. Only three, maybe four, are increasing, and they are doing so only modestly. Measured another way by biologists Liv Vors and Mark Boyce, who included the fate of boreal forest and mountain caribou in their survey, 34 of the 43 major herds scientists have studied worldwide in the past decade are in a freefall. Receding sea ice in the Arctic is revealing a treasure trove of energy resources that were once inaccessible. Scientists, conservationists and some Inuit leaders believe that the pace of development is proceeding too quickly and without rules, regulations and standards to prevent spills and accidents. Photo credit: Edward Struzik. With all of this in mind, what should be done? One clear course of action is to halt the activity giving rise to the change — fossil fuel consumption and the release of methane gas as permafrost thaws and sea ice melts. Given the pace of change and the long lag time, however, there is very little that can be done to stop the Arctic from warming in the short term. Humans have already released so much greenhouse gas that even if we stop right now, it will take centuries to halt or reverse the decline of sea ice cover, the thawing of permafrost, the meltdown of glaciers and the acidification of the Arctic Ocean, which is directly attributable to the increase in emissions. New economic opportunities may arise from oil and gas developments and commercial shipping, but those economic benefits could be offset by a blowout or shipping accident that could prove to be even more catastrophic than the Exxon Valdez disaster and BP’s Deep Water Horizon. Unlike Prince William Sound or the Gulf of Mexico, there is ice in the Arctic and no ports and few runways from which to stage a cleanup. There is also no practical way of separating oil from ice. There is, therefore, a need to develop technologies to increase safety of oil and gas extraction before exploration and extraction proceeds. There is also a need to identify and protect biological hot spots that are vulnerable to this kind of human activity. One of the biggest challenges in planning for the future is to figure out what the new Arctic (including the subarctic) might look like. Against a backdrop of boreal forest, tundra, permafrost, polar deserts, glaciers, ice caps, mountains, rivers, deltas, sea ice, polynyas, gyres and open ocean, that won’t be easy to do. There are thousands of pieces to this puzzle. They include the 21,000 cold-climate mammals, birds, fish, invertebrates, plants and fungi we know a lot about. They also include countless microbes and endoparasites that remain largely a mystery. Further discoveries of microscopic creatures new to science, such as the picobiliphytes found in the Arctic in 2006, are inevitable. A rigorous assessment of what the future might look like could help decision-makers understand who the winners and losers will be in a future Arctic and what other surprises we can expect. This will help identify which low-lying Arctic communities need to be shored up, moved or made fire safe. It could guide decision-makers in designing better rules and regulations for pipelines and resource development and for commercial shipping. It could also help decision-makers better understand, predict, mitigate and adapt to both changes in the Arctic itself and trickle-down effects to temperate regions. This is already being done with some success on a small scale. A program in Old Crow, the most northerly community in the Yukon, for example, successfully paired scientists with community leaders to address the issue of food security in a quickly changing climate. Similarly, in Alaska, the Landscape Conservation Cooperatives have facilitated partnerships between the U.S. Fish and Wildlife Service and other federal agencies, states, tribes, non-governmental organizations, universities and stakeholders within a number of ecologically defined areas. What the Arctic really needs, in addition to these and other small-scale initiatives, is international cooperation either through an overarching treaty or through a series of binding agreements. The issues are too big, too complex and in many cases too overlapping to be left to individual countries to address. In order for this to happen, the role of the Arctic Council needs to be strengthened. Science needs to be funded much better than it has been, the indigenous people of the Arctic must be equal partners in the decision-making process, and non-Arctic countries such as China must be included in the conversation. 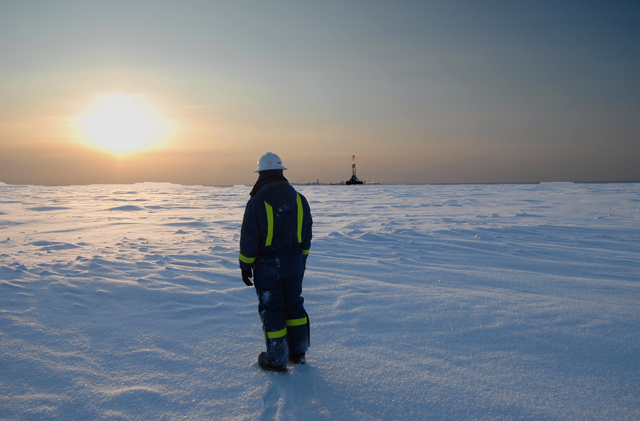 The future of the Arctic is not necessarily completely bleak. But if we continue to ignore or underestimate the changes that are taking place in this part of the world, it will, as climatologist Mark Serreze bluntly said in 2009, “bite us [and] bite hard.” Thanks to Ensia for permission to repost. Edward Struzik has been writing about the Arctic for over twenty-five years. His new book is Future Arctic: Field Notes from a World on the Edge.